Preparing to set off for a bicycle tour is exciting. Whether you are about to embark on a journey of your lifetime or just short trip there is a lot to consider before you set off. When we were planning our world tour on bicycles we felt overwhelmed with all the information available on the web. To help out first-time bicycle travelers we’ve compiled a list of travel tips inspired from questions asked by our readers, advice given to us by other bike travelers and our own experience. Some tips might seem like common sense but it is easier to see that from the comfort of your home. It’s just some ideas to get you thinking about life on the road. Like with anything you set out to do, you learn best by trial and error. 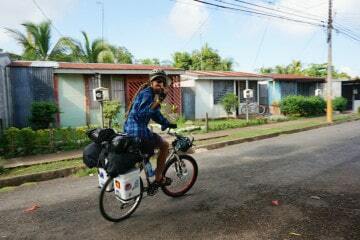 However some pointers along the way can help you make the most out of your first bicycle tour. 1. TAKE IT EASY. Don’t try to crank out 100km a day everyday. Too much cycling can wear you down and cause you to burn out. 2. DON’T SPEND TOO MUCH MONEY ON GEAR. It’s easy to get caught up in all the high tech travel gear that is out there. Remember to keep it simple, you will appreciate it when you have more money to spend on ice cream after a hot day of cycling! 3. Learn at least the basics of LANGUAGE OF THE COUNTRY you plan to cycle in. Not only will you be able to order food and ask for directions you will be able to have conversations with locals. 4. DON’T BE AFRAID TO ASK. Most people want to help, if there’s something you need whether it’s water or directions just ask. 5. DON’T BE AFRAID TO BARGAIN. In some cultures bargaining is the norm. We saved lots of money in Mexico asking for discounts at hotels and markets. Of course don’t fight over a few cents when someone is in more need than you are. 6. SOMETIMES YOU NEED A LIFT. 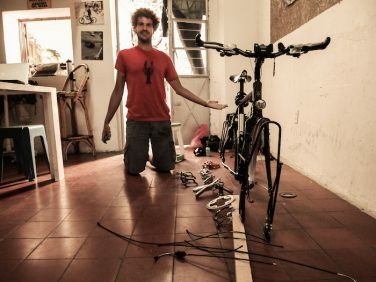 Your bike breaks down, you get sick or maybe you are just fed up with cycling. There’s no shame in asking for a ride or taking a bus every now and then. 7. Put down the GPS and TALK TO PEOPLE. When you are lost cycling down some dirt road leading to who knows where, a GPS will do little to help you. 8. TAKE A BREAK. The daily grind of cycling, camping and eating pasta every night can get old. It’s good to take a break from time to time to recharge your body and mind. 9. 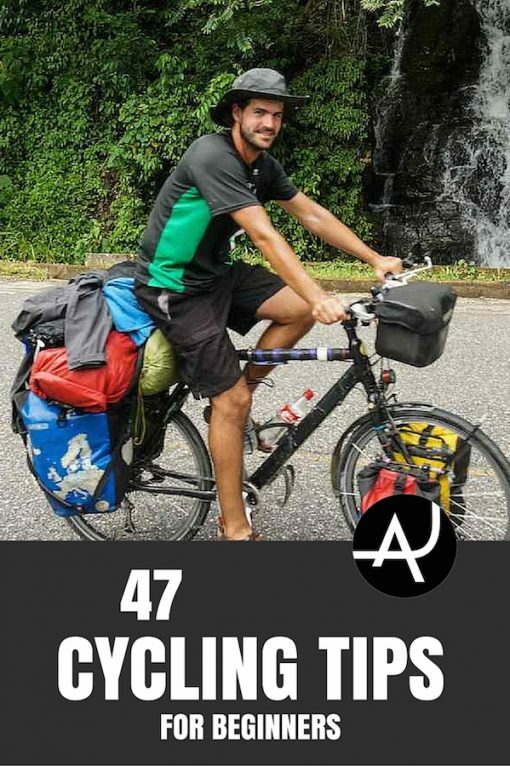 BE INVOLVED IN THE BICYCLE TOURING COMMUNITY. 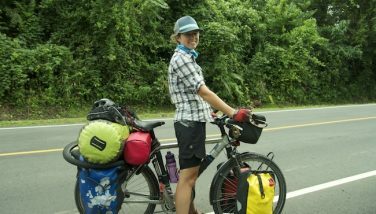 The web is filled with great bicycle touring blogs, forums and groups of bicycle tourists for you to take advantage of. It’s a great way to research routes, ask questions, get advice and connect with other bicycle travelers. 10. ASK TO CAMP. Camping saves you an incredible amount of money while on tour. Police and fire stations often host cyclists and allow them to camp on the station grounds. Bring you own tent or camping hammock and you are all good to go. 11. WATCH OUT FOR SPEED BUMPS. We have met several cyclists who have had some major injuries caused by not seeing speed bumps on downhills. 12. It’s okay to SPLURGE EVERY NOW AND THEN. If you’ve had some rough days on the road treating yourself to some good food or a nice room is a quick way to lift your spirits. 13. TAKE LOTS OF PICTURES. Some of the best pictures we have are from when our friend Pablo came to visit. We had already been on the road for a few months and the day to day life of cycle touring had lost its photo interest but not for Pablo. His photos of our nights camping, cooking and cycling always bring back fun memories. 14. PICK UP ABANDONED CLOTHES. Sometimes we come across a t-shirt on the side of the road and we pick it up and use it as a rag to clean the bike. 15. LOOK OUT FOR FRUIT TREES. 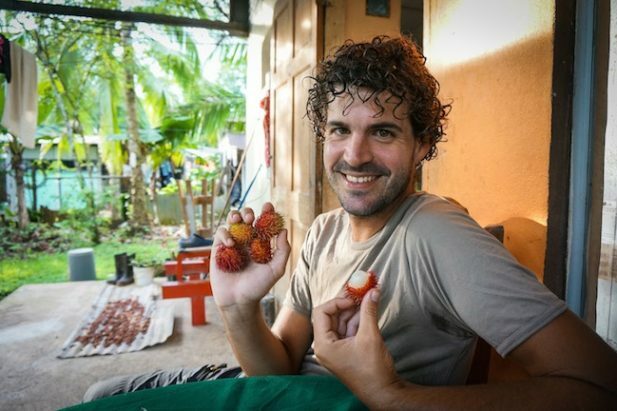 Fruit trees, especially in tropical countries are great sources for afternoon snacks. 16. GET OFF THE BIKE. Don’t abandon your other interests just because you are on tour. Hiking and other outdoor activities are great ways to spend some time off the saddle. 17. KEEP A JOURNAL. Writing at the end of the day or during your lunch break is great way to use your mind. 18. MAINTAIN YOUR BIKE. Simple maintenance such as cleaning and oiling the chain can go a long way. 19. START AS SOON AS YOU CAN. Make someday today. 20. If you use ORTLIEB PANNIERS carry a repair kit. These patches were life savers when squirrels chewed two massive holes through my front panniers! 21. BE OPEN TO LEARNING. Traveling is a great way to learn new skills such as languages or cooking. 22. Get used to being asked the SAME QUESTIONS OVER AND OVER…and over! Where are you from? Where are you going? Try to keep a smile on your face and remember it might be the first time this person has ever met someone traveling by bicycle. 23. USE HOSPITALITY WEBSITES such as Warmshowers and Couchsurfing. 24. If you are traveling through a country in which the LANGUAGE IS VERY DIFFERENT than your own write a few sentences about yourself and your trip and find someone who can translate them into the local language. 25. If you are traveling as a couple, in some traditional countries it’s best to SAY THAT YOU ARE MARRIED instead of just boyfriend and girlfriend. 26. PROTECT YOURSELF FROM THE SUN. I’ve even started wearing a lightweight long sleeve shirt to protect my arms from becoming fried. 27. TRY LOCAL FRUITS AND DISHES. 28. Find PODCASTS on topics that interest you and listen to them while cycling. 29. DON’T GET TOO FRIENDLY WITH STREET DOGS and remember to wash your hands if you touch them. 30. CARRY ENOUGH WATER BOTTLES and refill them often. Running out of water in the middle of nowhere is a terrible feeling. 31. HIDE YOUR PASSPORT AND CASH in your back panniers. 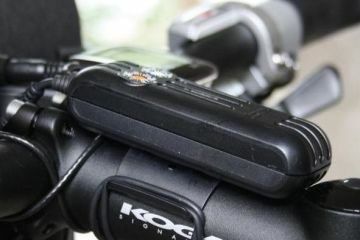 Keep a small amount on your handlebar bag for daily expenses. 32. Keep a BAR OF SOAP HANDY so you are able to wash your hands after changing a tire. 33. You DON’T NEED ULTRA CYCLING CLOTHES. I prefer comfortable casual clothes while cycling opposed to cycling clothes. When we get to town I feel like less of a weirdo! 34. BE FLEXIBLE. Weather and road work can force to change plans, roll with it. 35. WHEN YOU MEET OTHER BICYCLE TOURISTS on the road don’t bombard them with a million questions about how many times they change their chain and what type of tires they use. 36. Don’t be afraid to GIVE UP YOUR PLANS and take each day as it comes. 37. TAKE CARE OF YOURSELF. Eat well, shower and wear sunscreen. We’ve meet some rough looking cyclists out there! 38. EXPLORE. There are some routes that are little to unknown don’t be afraid to leave the main road to explore them. 39. WRITE TO YOUR MOM. While on the road it’s easy to loose track of days. While you are living in the moment your parents and loved ones want to hear from you. 40. Don’t be afraid to CARRY A LITTLE EXTRA WEIGHT for something you enjoy. There are some non essential items that bring me a bit of joy, like when I can take off my sweaty cycling sandals and put on my flip flops at the end of the day. 41. DON’T WORRY WHAT OTHERS THINK. 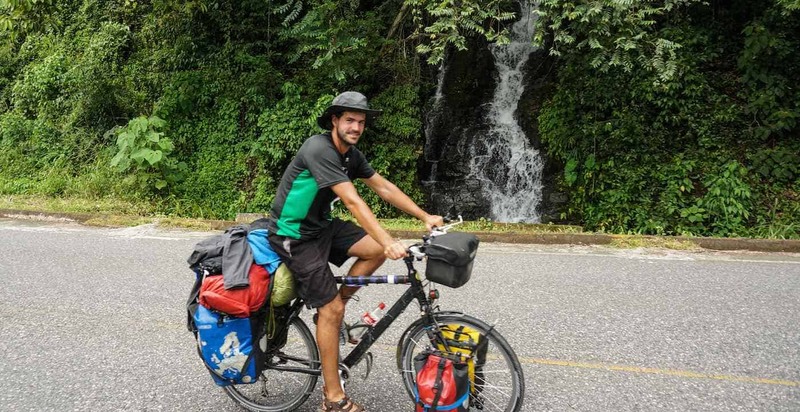 There will be plenty of people out there telling you are crazy for wanting to go travel by bicycle. 42. Don’t worry to much about PRE-TRIP TRAINING. 43. Remember HARD TIMES ARE NEVER FOREVER. The uphill climb will eventually lead to an amazing down hill. 44. If you are sensitive to light and sounds carry a pair of EAR PLUGS AND AN EYE MASK. Sleeping outside, the sunrise and rooster crows will prevent you from getting those extra hours of much needed sleep. 45. INVITE YOUR FRIENDS. You might be surprised which of your friends would be willing to come join you on the road for a few weeks. 46. DON’T WORRY ABOUT GOING TOO SLOW. It’s not a race. The slower the go the more you will see and experience. 47. HAVE FUN! Don’t take touring too seriously. Enjoy the ride. 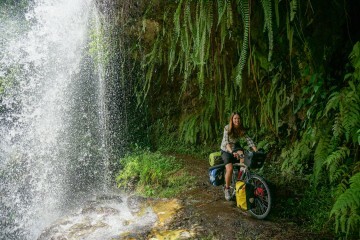 Put drier sheets in your panniers, tent and sleeping bag to keep things a little fresher along the way. – Kristin and Rusti of Krusti’s Slide Show Blog.